Windows stop errors, also known as the Blue Screen of Death (BSOD) errors, are the worst PC errors imaginable. Windows 8 BSOD errors are no exception. They appear out of the blue, your computer crashes and starts rebooting, and they are very difficult for the average user to figure out. The DRIVER_POWER_STATE_FAILURE is one of these errors. What Causes the DRIVER_POWER_STATE_FAILURE BSOD? All Windows stop errors happen for the same reason – something goes wrong and your operating system can’t go on functioning. As you can see from the error message, this particular Windows 8 blue screen error is related to a driver and has something to do with your power options. We’ve already established that this particular Windows 8 Blue Screen of Death error is caused by a driver. This means that you’ll have to check your device drivers for conflicts and see if any of them need to be updated. If you can read your debugging information in the .dmp file, then you will be able to find which of your devices has a driver problem. If not, simply open the Device Manager and check them all. Pay special attention to your SSD or HDD because they often cause this Windows BSOD. On the Apps screen, scroll to the right until you see the Windows System heading. Windows 8 will open the Control Panel. Click on the Hardware and Sound link. In the Hardware and Sound window, click on Device Manager, located under the Devices and Printers heading. Now check if any of your drivers have a yellow warnings icon and update them if needed. Use only the manufacturer’s website to download the latest version of your driver. 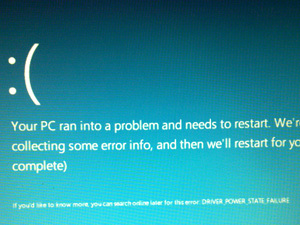 Quite often the DRIVER_POWER_STATE_FAILURE BSOD is caused by poorly configured power options for your SSD or HDD. In most cases, disabling power saving for your SSD or HDD (or both) helps to get rid of the BSOD. 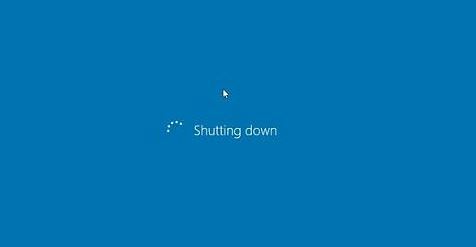 Basically, when Windows tries to turn off your disk to save power, there is a conflict and that’s when you get the stop error. So simply turning off this features can save you time and trouble. One of the major causes of STOP errors is the Windows registry – the main database of your computer. It stores vital information and settings for your PC, and is used continually to help Windows read files, settings and options that it needs to run. Even though the registry is one of the most important parts of every Windows system, it’s known to cause a lot of problems because it often becomes corrupted and unreadable. Cleaning the registry with a reliable registry cleaner will help.